This is the best car for you if you want a midsize luxury sedan that flies under the radar – and one soon to become even more rare than it already is. This rear-wheel-drive-based four-door with performance intentions debuted in 1991, as part of parent-company Toyota’s Japanese lineup. That Toyota Aristo arrived stateside in 1993 badged the GS and slotted between the less expensive ES and the brand’s flagship LS. The ’18 model is part of the fourth design generation and debuted for model-year 2011. It offers a broad range of powertrains: conventional four- and six-cylinder engines, a V-6/battery-electric hybrid, and a high-performance V-8. By contrast, the ES can be had with V-6 and hybrid power as well, but it employs a less-sporty front-wheel-drive architecture derived from the previous-generation Toyota Camry. Tailored to easy-driving entry-level luxury, the ES has been a smash hit, the sales leader in its segment and outselling the GS nearly 10-1. Despite rock-solid construction and a true premium interior, the GS never really connected as a rival to the likes of the Audi A6, BMW 5 Series, and Mercedes-Benz E-Class. Sales are down nearly 50 percent in calendar 2017, placing it near the bottom of the competitive set. It’s even outsold by the upstart G80 from South Korean automaker Hyundai’s new Genesis luxury division. Buy the ’18 because there isn’t likely to be a ’19. The GS would be due a redesign for ’19, but with sales in the tank, we expect Lexus to discontinue it. Toyota is instead investing resources into development of the next-generation ES for model-year 2019. The only vestige of the GS you’re apt to see in the new ES is all-wheel-drive capability. That makes the 2018 GS an interesting proposition. It ought to be available with juicy discounts, and Lexus has mostly held the line on 2018 pricing and even lowered prices on several iterations to begin the model year. And you’ll rest easy that the brand’s renowned reputation for reliability and red-carpet customer service will continue even after the GS is dropped. The ’18 lineup consists of the turbocharged four-cylinder GS 300 (formerly GS 200t), the V-6 GS 350, the hybrid GS 450h, and the hot-rod V-8 GS F. All come standard with rear-wheel drive; all-wheel drive (AWD) is available on the GS 350. An F Sport Package for the 300, 350, and 450h includes upgraded suspension tuning and unique exterior trim. Note that Toyota prices these F Sport Package vehicles as separate models. Styling: The fourth-generation GS debuted for the 2011 model year and was updated for 2015. Part of that freshening included styling updates that brought the vehicle in line with other Lexus models. The front end sports the brand’s signature, albeit polarizing, “spindle” grille, surrounded by satin-chrome trim and flanked by standard LED headlights. Exaggerated lower cutouts house available LED fog lights. The side view is reminiscent of the ES, while the rear fascia looks lower and more aggressive than its smaller sibling. The F Sport Package adds 19-inch staggered split-spoke wheels (up from standard 17s on the GS 300 and 18s on the 350 and 450h), a unique spoiler and front bumper, mesh grille, and F Sport badges. The GS F has all this, along with wider wheel arches, a carbon fiber front valance and rear spoiler, air ducts on the front fenders, and its own unique wheels. On the inside, the GS cabin follows in the business-like nature of the BMW 5 Series. Materials quality, though very good for the price, falls a bit short of the country club opulence found in the Audi A6 or Mercedes-Benz E-Class. All use Lexus’ Enform infotainment system; models equipped with the available imbedded navigation system get a 12.3-inch widescreen display with crisp graphics. It’s not a touchscreen, though. User interactions rely on a console-mounted joystick, surrounded by supplementary buttons. It works well enough, but the stick is overly sensitive, making it easy to have the on-screen indicator shoot past the function you intended to activate. The climate and other controls are logically arranged. GS F models have a unique instrument cluster that includes a center-mounted tachometer, flanked by a tiny, hard-to-read speedometer (thankfully the tach includes a redundant digital readout), and a multi-information display that can show audio and navigation data. It also has a specific “track” page that can display performance attributes, including 0-60-mph acceleration runs, lateral grip, and more. The GS F also has unique interior trim with smatterings of carbon fiber, Alcantara faux suede, and blue contrast stitching throughout. Despite its exterior size, the GS’ cabin feels a bit snug, especially in terms of headroom. Adults greater than 6 feet tall will want to take a long drive to make sure they will be comfortable. The GS F has sculpted seats all around. The fronts have prominent side bolsters to keep occupants in place when cornering, but bulkier folks will find them confining. The rear bench has deep scoops cut out of the bottom cushion. Again, it’s to keep folks from sliding around, but they will cramp those who are wider of leg and bottom. Mechanical: At the entry level, the GS 300 uses a 2.0-liter turbocharged four-cylinder engine with 241 horsepower and 258 pound-feet of torque. Most GS buyers opt for the 350, which has a variant of Toyota’s corporate 3.5-liter V-6; in this application, it produces 311 horsepower and 280 pound-feet of torque. The hybrid GS 450h pairs a different 3.5-liter V-6 gasoline engine with a battery-powered electric motor. Combined system output is 338 horsepower; Toyota does not provide peak torque figures, but the gas engine produces 257 pound-feet. The high-performance GS F gets a 5.0-liter V-8 that produces 467 horsepower and 389 pound-feet of torque. 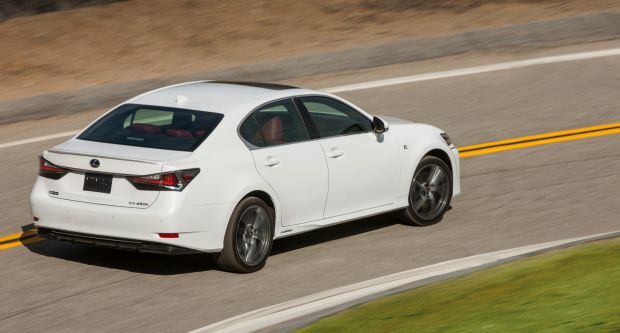 The GS 300, rear-drive GS 350, and GS F use an 8-speed automatic transmission. The AWD GS 350 has a 6-speed automatic, and the GS 450h has a continuously variable automatic (CVT). We have not evaluated a four-cylinder GS; Lexus says it will do 0-60 mph in 7.0 seconds. The conventional GS 350 will have more than enough oomph for most buyers. Lexus says 0-60-mph takes 5.7 seconds in the rear-drive model and 5.8 with AWD. The GS 450h isn’t much quicker overall, but the instantaneous torque provided by the electric motor makes it feel sprightlier off the line. GS F targets other high-performance luxury sedans, including the Audi S6, last-generation BMW M5, Cadillac CTS-V, and Mercedes-Benz E43 and E63 AMG. Lexus claims 0-60-mph acceleration of 4.5 seconds, which is probably about right, though the transmission feels like it’s holding the engine back a bit. It doesn’t always shift smoothly, and it can be slow to downshift when more power is requested. The F, like other GS models, has a drive-mode selector that adjusts engine and transmission performance among Eco, Normal, Sport S, and Sport S+ settings. A dual-mode exhaust changes the engine note at speeds above 3,500 rpm, producing a delightful roar at wide open throttle. Handling is more than competent in regular GS models, a bit sharper with the F Sport Package, and racetrack-worthy in the GS F. The latter reacts very quickly to steering inputs, and its grip on dry roads in tremendous. If you live where it rains and/or snows frequently, you will want to invest in a set of appropriate tires. All this handling prowess comes at the expense of ride quality. The GS F is very firm, and it lacks the precise bump control of the S6 or CTS-V. It stops short of all-out harshness, though. Features: Even the base GS 300 comes with a decent level of standard equipment that includes LED headlights, power sunroof, drive-mode selector, Lexus’ “NuLuxe” leatherette upholstery, 10-way power adjustment for both front seats, driver-seat memory, power tilt and telescopic steering wheel, and a 12-speaker surround-sound audio system. For 2018, Lexus is extending its Enform Safety and Service Connect telematics services from one year at no charge to 10. Standard driver-assistance features include blind-spot alert with rear cross-traffic detection, pre-collision braking with pedestrian detection, lane-departure warning with steering correction, automatic high-beam headlights, and full-speed radar cruise control. 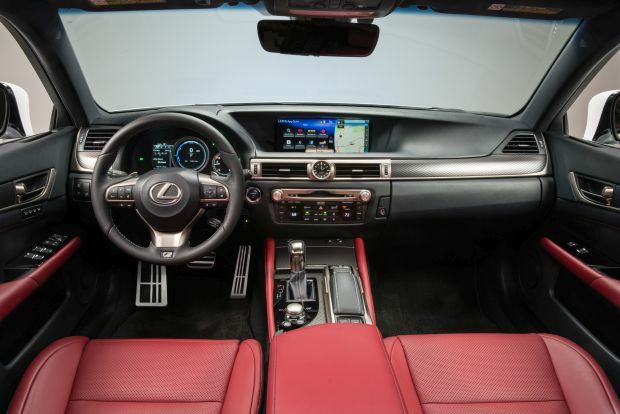 The GS 350 adds genuine leather upholstery, heated front seats, and imbedded navigation with ultra-widescreen display. The 450h includes an adaptive suspension, power rear sunshade, rain-sensing windshield wipers, and ventilated front seats. GS F has a performance suspension, wheels, and tires, but it lacks the 450h’s rear sunshade. Lexus is largely holding the line on pricing for the 2018 GS. The GS F is up $410. 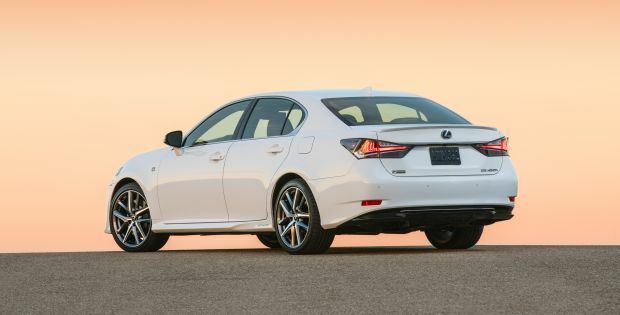 The GS 300, 350, and 450h are unchanged, and these models with the F Sport Package are actually cheaper than their 2017 counterparts – by more than $2,000 in some instances. Note that base prices shown here include Lexus’ $995 destination fee. The GS 300 starts at $47,305, the rear-drive GS 350 at $51,690, the AWD GS 350 at $51,360, and the GS 450h at $64,630. With the F Sport Package, the GS 300 is priced at $51,895, the rear-drive GS 350 at $53,055, the AWD GS 350 at $54,800, and the GS 450h at $69,675. Base price for the range-topping GS F is $85,345. The GS 350’s standard navigation system is available as a no-cost option on the GS 300. Other extras for this model include the $1,400 Premium Package that includes a power rear sunshade, rain-sensing wipers, and heated/ventilated front seats. Replacing the standard 17-inch wheels with 18s is $905, and you have the choice of all-season or summer-only tires. Options for the GS 300, rear-drive 350, and 450h include an upgraded Mark Levinson audio system for $1,380, hands-free parallel parking assist for $500, and a power trunk for $400. The 300 and 350 offer a heated steering wheel for $150, The AWD GS 350 is available with the 300’s Premium Package for $1,760. The Cold Weather Package is $290 and includes headlight washers, windshield wiper de-icer, a high-capacity heater, and water-repellent front door glass. Options exclusive to F Sport and GS F models include orange-painted brake calipers for $300 and “Ultrasonic Blue Mica 2.0” paint for $595. F Sport versions are available with upgraded headlights for $1,160. A head-up instrument display is a $900 extra exclusive to the GS F.
For a bit less than $55,000, and AWD GS 350 with Premium Package and Mark Levinson audio system is our pick. Buyers in colder climates will want to pony up for the heated steering wheel and Cold Weather Package, which will bring the price up to closer to $56,000. A fully equipped GS F will set you back slightly less than $90,000, which is in the same ballpark as a comparably equipped Audi S6, Cadillac CTS-V, or Mercedes-Benz E43 AMG. It’s less than the BMW M6 Gran Coupe and Mercedes E63 AMG S. The GS F doesn’t come off as ostentatious as any of these rivals, save perhaps the S6, so if you want to go fast without shouting about it, this Lexus might be the way to go. EPA fuel-economy ratings for gas-only models are not outstanding. The GS 300 rates 22/32/26 mpg city/highway/combined. The GS 350 rates 20/28/23 mpg with rear drive and 19/26/22 with AWD. With the F Sport Package, the GS 300 rates 21/30/24 mpg, the rear drive GS 350 19/27/22 and AWD GS 350 19/26/22. The hybrid GS 450h fares better, rating 29/34/31 mpg in all forms, while the GS F brings up the rear at just 16/24/19. Premium-grade 91-octane fuel is required for all models. With the GS getting hit especially hard by the downturn in sedan sales, we expect Lexus to drop it from the product portfolio, most likely at the end of the 2018 model year. Some time during calendar 2018, the company should introduce a redesigned ES sedan that will use the “Toyota New Global Architecture” (TNGA) that underpins the 2018 Camry and other vehicles. The new ES will retain a front-wheel-drive layout while being longer and lower, which should give it a sportier edge versus the current car. It certainly won’t be as enjoyable to drive as the GS was, and we hope all-wheel drive becomes part of the package. Acura RLX, though it shares the Lexus’ reputation for reliability, this Acura delivers a much duller driving experience. BMW 5 Series, which has gotten bigger, softer, and pricier as part of its recent redesign. Mercedes-Benz E-Class, which is also newer than the GS but suffers from the same issues as the 5 Series, not to mention a reputation for unreliability. Audi A6 and S6, which are the class benchmarks for understated style, interior design and comfort, and driving engagement. Cadillac CTS, particularly the high-performance V edition, which is more powerful and faster than the GS F while not being much more expensive. Infiniti Q70, which offers V-8 power without needing to buy an ultra-performance model, as well as an extended-wheelbase body style for greater passenger comfort.